I've been told yet again that I look like somebody else. It's been a while, but this time it wasn't the usuals. which I can see, and don't mind since I think he's pretty darn funny. which I don't so much agree with, but certainly don't mind since he's been in some of the best movies and also has a great sense of humor. I think the big thing is we both have unique noses - his was actually broken, though. Mine is naturally unique. Shut up. 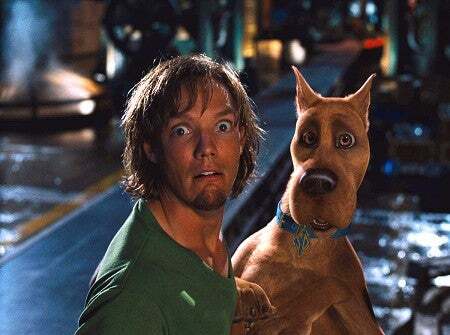 Shaggy, not Scooby. Again, shut up. :-] I don't really see this one, personally, I think it's just the goatee thing. For those who haven't seen me in a while - or ever - I have a bit of a goatee now. I dunno, I guess I'm indifferent to this comparison. It's kinda funny. I think you look like Scooby. I have been told I look like James Hetfield, the lead singer from metallica, shaggy(the cartoon one), sean penn and that one white guy from that one movie.